Apparently, our little four block square of streets is famous throughout Fort Wayne as being THE place in town to go trick or treating. That’s “THE” as in “THE ONE AND ONLY”. Hundreds came, from all over town, and from all backgrounds: rich, poor, white, black, Latino, cartoons, undead, Hogwart students. You name it, we saw it. 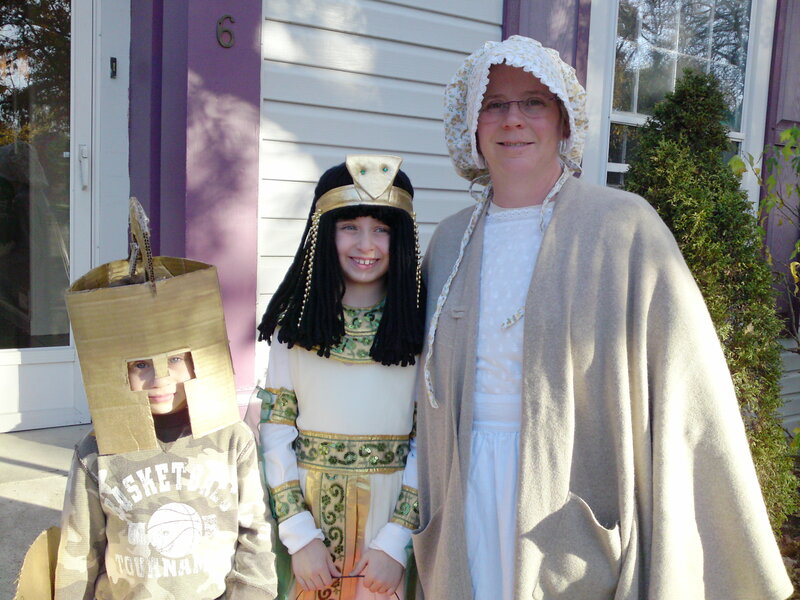 Dawn (Ma Ingalls) took Rose (Cleopatra) and Sam (Percy Jackson) out at 5:00 PM. I didn’t think they’d last long, but they stayed out two hours, returning twice to fix Percy’s cardboard shield when he tripped on steps, finally returning at 7:00 PM with Sam barreling home to pee. As we divvied the candy in the den, carefully separating nut-free from nut-infested, Rose told me about the impostor Cleopatra she met and how they played silent Mirror Mirror with each other.